All Jenn, All the Time. For today’s creative project, I gave a new recipe a try. I bought some pecans, with the intentions of trying out a few recipes for candling or flavouring them. They were fast and easy. They tasted okay, but weren’t as good as I thought they’d be. I’ll post the recipe after the pic incase you want to give them a try. Heat oven to 350F. Lightly spray a shallow baking dish with vegetable oil spray. Stir together 1/4 cup sugar and water, stirring until sugar dissolves. Add pecans; let soak 10 mins. Drain water and discard. Stir together remaining 2 Tablespoons sugar, cocoa, chilli powder, and cayenne pepper in medium bowl. Add pecans and toss to coat. Spread pecans on prepared pan. 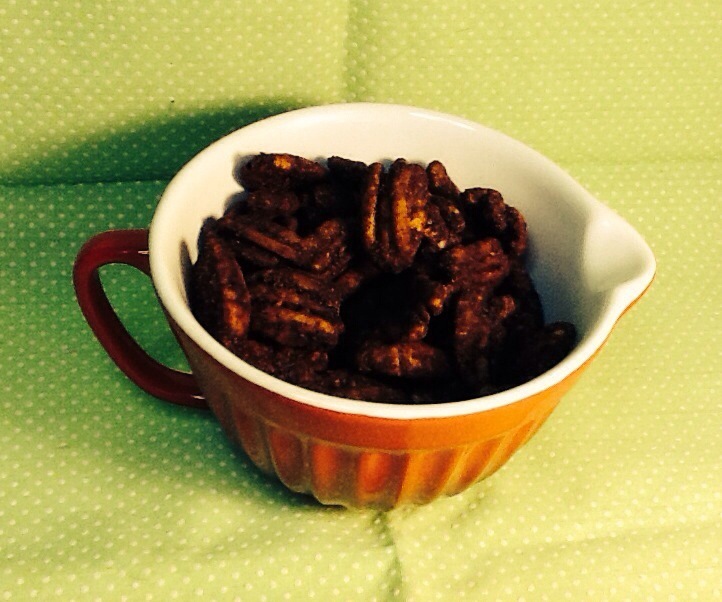 Bake 10 a 15 minutes or until pecans start to glisten and appear dry. Stir occasionally while baking. Cool completely. Store in a cool, dry place. Ok, this one is a cheat, I’ll be honest. I made these a couple of days after Christmas. We were invited to a friend of Robs for Christmas dinner. I intended to make a cheesecake for the date. Well, I did make a cheesecake, it just flopped. It was my fault completely; I had gone back and forth as to which cheesecake I was going to make (I have a cheesecake cookbook), and decided that I’d make it easy on myself and make my most made cheesecake, Rob’s favorite, Key Lime. We stayed out too late Christmas Eve, so I was tired by the time I got home. I made the cheesecake, and just shut the oven off when it was done, the same time it always takes, and went to bed. Turns out it wasn’t done. I didn’t notice until it was too late to cook it for a bit more. So,it was gooey in the middle, and I wasn’t bringing it to the party that way. I was talking about it at dinner, and our host Byron gave me the great idea to make frozen cake pops out of them. 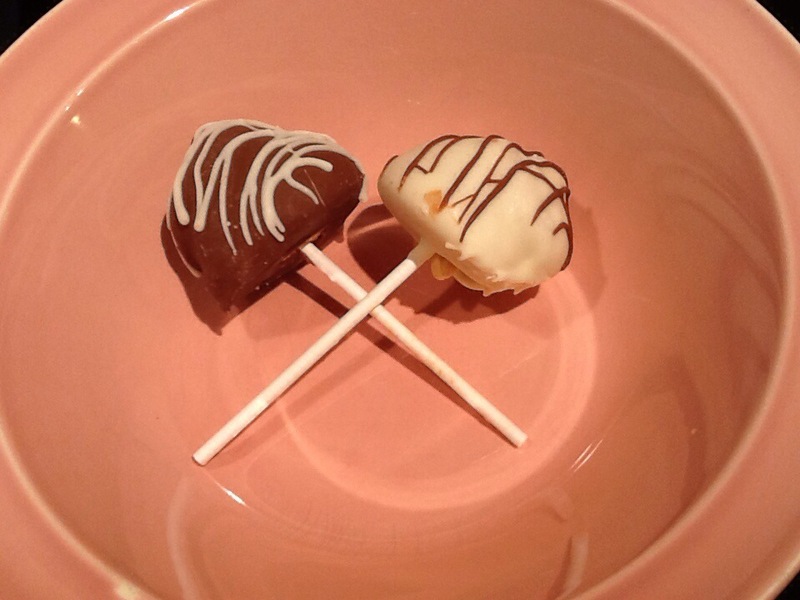 I’ve never made cake pops, and it’s easier said than done, with cheesecake anyways. I out the whole cheesecake, crust and all I to the food processor to blend, then froze the batter. However, they just wouldn’t form perfect little balls, even with a cookie scoop. So, I put the goo into a piping bag and piped them out onto a cookie sheet and stick them back into the freezer. When they were frozen again, I took them out and dipped them into melted chocolate. Voila! They’re not very pretty, but they’re yummy! Today’s tea is a part of my collection at home, and from what I understand, it must be one of David’s best sellers, as they have a hard time keeping it in stock in store. 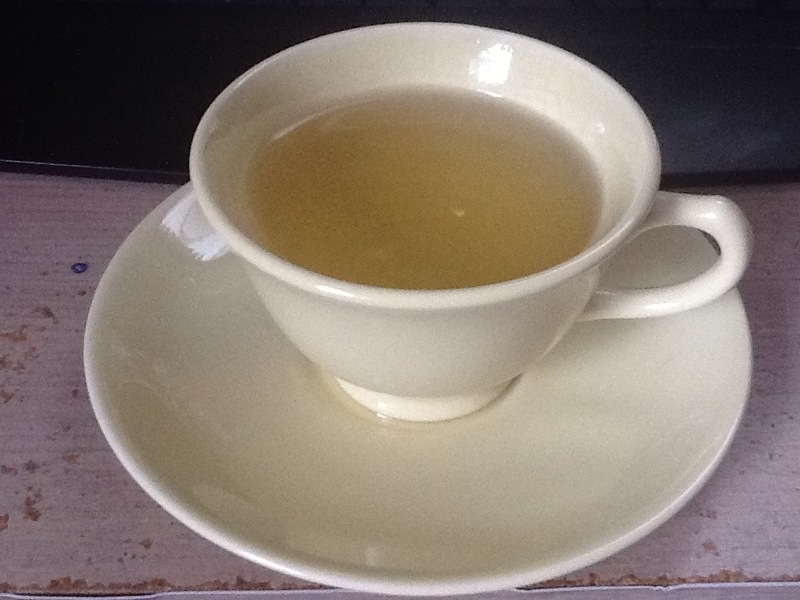 The Skinny is an oolong tea, and contains ginseng, which is supposed to aid digestion and help stop fat absorption in the body. I’m not too sure about its weight loss claims, as I don’t drink this tea regularly, but it is a nice finish to a heavy meal. 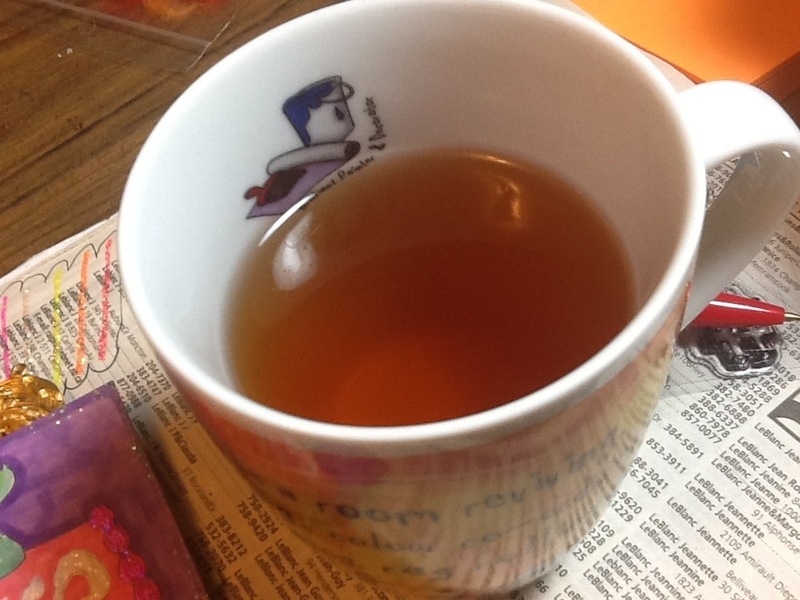 It’s slightly similar to orange pekoe, but with a hint of sweetness. I give The Skinny a 3.5 out of 5. I give Sweet Dreams a 3.5 out of 5. Sorry for missing my post yesterday. I went to bed as soon as I got home after work yesterday, and didn’t get up until this morning. 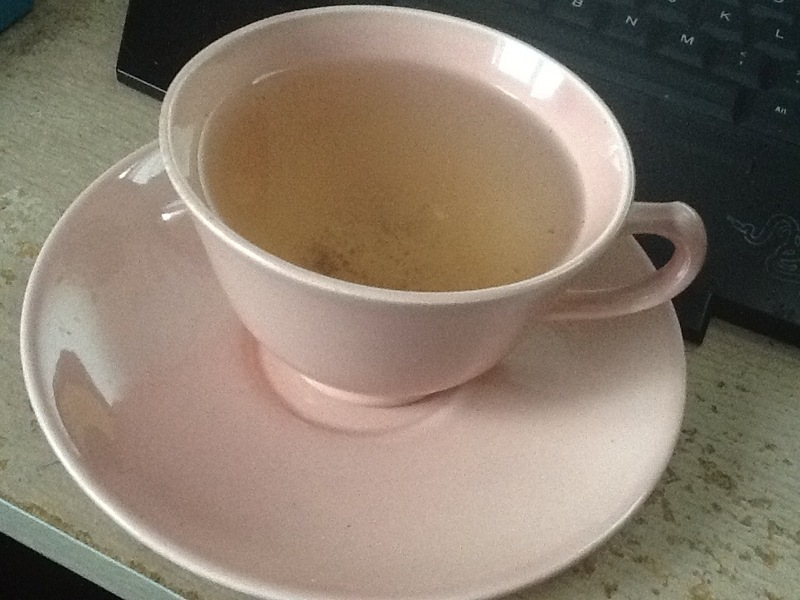 So, I had two teas this morning. Yesterday’s tea was Kiwi’s Big Adventure. 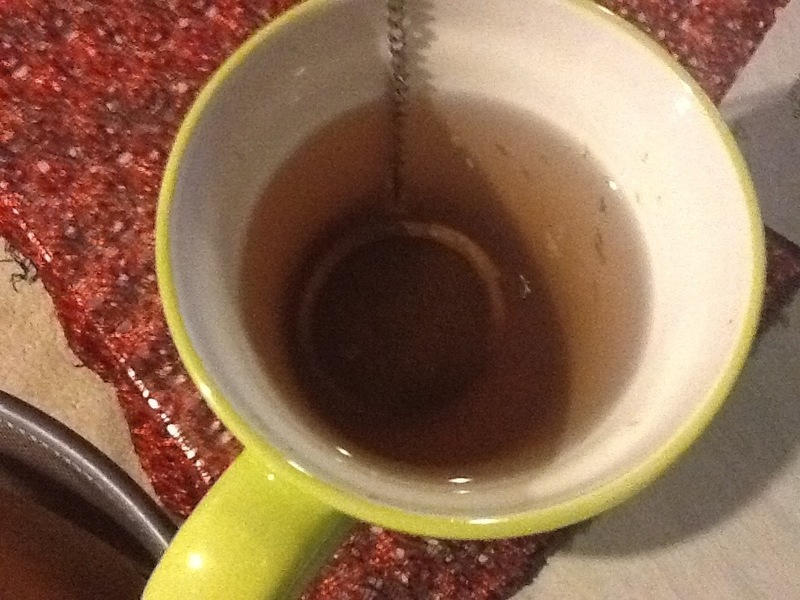 I have to say, this tea was pretty good for a green tea. The kiwi fruitiness really takes Ll but. Bit of the green tea taste out of it. I give Kiwi’s Big Adventure a 3.5 out of 5.